I’d like to continue my Blogs on the natural laws that Natural Healthcare Practitioners have been taught and also see daily in clinical practice. For example, “no pain, no gain” and “worse before better” are common ways to experience the natural ways in which a body gets itself better. You might also have heard of “detox reactions” or as I was taught “healing crisis”. In truth it is ideal to actually minimise these “worse before better” reactions if possible but they do hold truth, it is how the body does get better. Let me explain more. There is a natural and predictable order to how we will get better from an illness or disease and actually there is an order in which we will get progressively more ill. Our bodies are very clever and will do everything they can to protect vital organs at the expense of other less vital organs or parts of the body. Inflammatory, autoimmune or Rheumatoid Arthritis offers a nice example of this. It is well documented and in fact taught in text books that Arthritis virtually always starts in the small joints of the hands and feet (N.B. I’m not talking about ‘wear and tear’ Arthritis here). There are various causes of Arthritis but basically it is inflammatory chemicals in the blood stream irritating joints. Here’s the “natural law” though, the body has purposely deposited the inflammation in the peripheral joints (hands and feet) first. It has spared the larger joints, like spine, hips and knees for the time being as they will incapacitate you more. But do realise if you don’t improve your health at that point with diet and lifestyle changes to decrease the inflammation, then the Arthritis will eventually progress into the larger joints. Let me explain “in reverse chronological order of the appearance of symptoms” as this fits nicely with Osteopathy. Let’s put this into a common scenario of a patient that might visit one of our Osteopaths. The patient visits with ankle pain and expects us to treat their ankle. However, on discussing their case history we often find that they had knee pain a few months ago that has got better and they have had low back pain for years and years on and off. If I was to simply treat the ankle pain and fix that it would be totally normal for the knee pain to return and if I then treat the knee the low back pain might get worse temporarily until I treat that. The patient’s body is “unwinding” back through all the old problems that originally gave them the ankle pain, in reverse chronological order of how they got them. It might be that their low back twisted to the right from sitting at a desk all day, this caused the knee to twist left and gave them a flat foot which strained the ankle. As I un-twist each area the next area then finds itself in a compensation position that it doesn’t have to be in, so the body will focus there to correct that. When the body “focuses” on an area it usually does so with some inflammatory chemicals which is how the body heals itself. So inflammation is good when healing, but bad when out of control. You will know when the body is doing this as we feel it as pain! This is the “worse before better” phenomenon. The body doesn’t jump from an old, chronic injury to being better, it will go to the old injury, inflame that injury to heal it (which makes it sore), then it will get better. The Osteopaths at The Perrymount are highly trained to understand this order of cure. We can predict some of the issues that will occur before they occur. So actually in the example above we would already have noticed quite easily that the original issues stemmed from the low back and would have treated that at the same time as paying some attention to the ankle. All The Perrymount’s Natural Health Professionals understand these natural laws; they are trained in them and see them daily in clinic so we can reassure and explain them to you as you go along though treatment. If you would like to book an Osteopathy treatment or another treatment with one of our professionals please call 01444 410944. 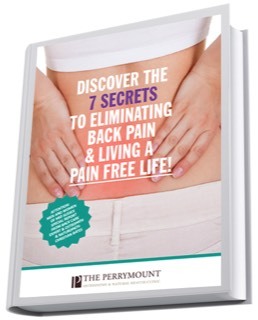 Download the free e-report and discover the common causes of back pain and how to eliminate them for a pain free life. Written by osteopath Christian Bates this report talks through the most common causes of back pain and most common poor posture patterns that osteopaths see and how you can go about improving them.